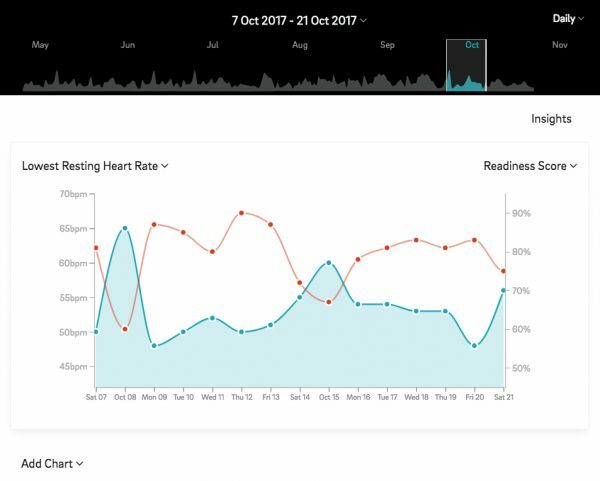 Oura users who want to take a deeper look at their data, beyond on the robust information offered in the app, can do so with Oura Cloud. 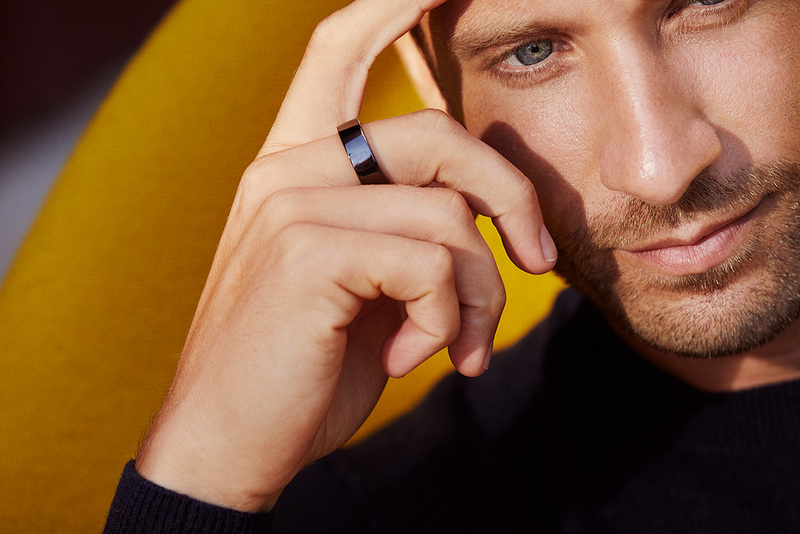 It’s your personal dashboard for the data that the Oura ring and app collect and analyze from and for you. Here’s a quick recap of what the Oura Cloud is – along with a primer on the Trends View. We must say, we’re pretty excited about Oura Cloud and we hope you are too! We’re always continuing to tinker with Oura Cloud, which means we’ll keep making it even better and adding new features from time to time. 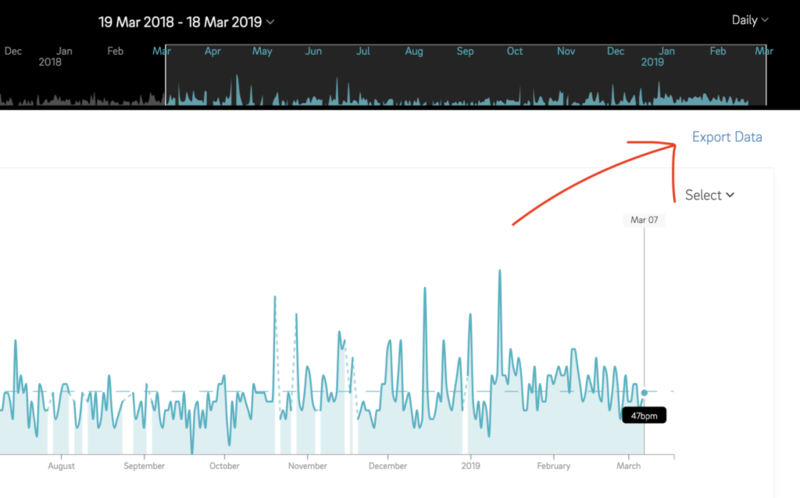 Basically, Oura Cloud shows you a more in-depth view on the data and visualizations that are available in the Oura app. In the Dashboard View, you can see more exact numbers behind your sleep, activity and readiness contributors than in the app (e.g. percentages). In addition, there are some more specific visualizations available, such as your heart rate variability (HRV) curve from the night. What about the Trends View, the new kid in town, then? We at Oura believe that what matters is your long-term wellbeing: the balance between your load and recovery from week to week, month to month. That’s also why we’re certain that you’ll be interested in the Trends View. The Trends View shows you how well you sleep, move and recover in the longer run. 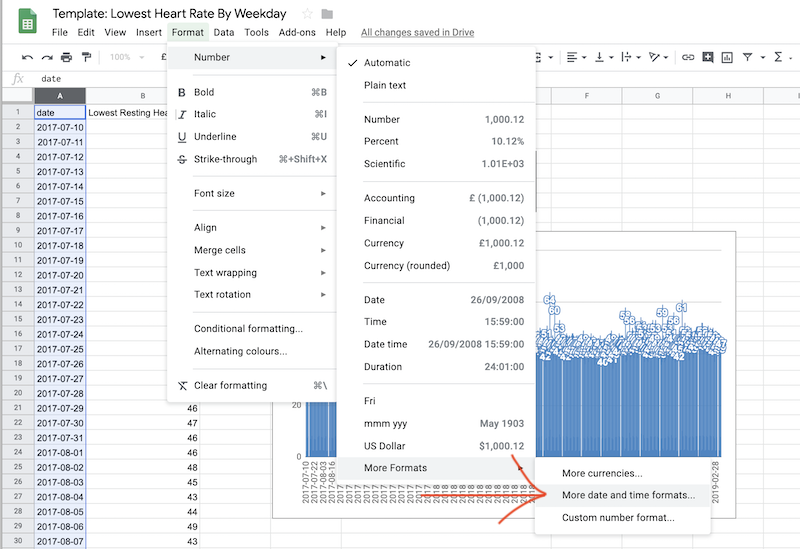 What you see is averages of your data, because as said, when we look at trends, we’re not that interested in a value from a specific day, but how we’re doing in general. 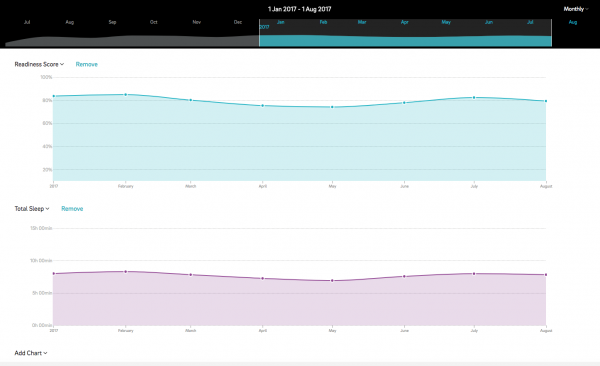 In practice, you can choose from several measures and scores Oura tracks and analyzes, and see how it changes or fluctuates over time. You can, for example, examine whether your sleep or readiness score changes over the year. 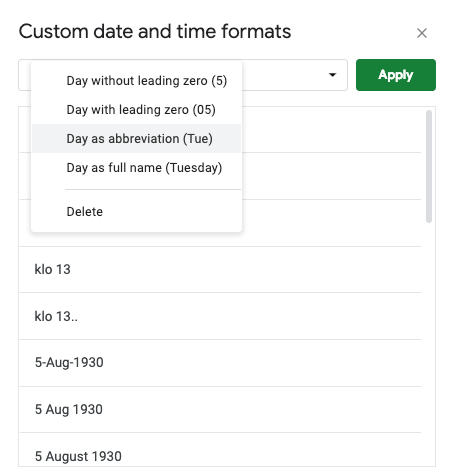 In addition to the score or measure, you can select the timeline you want to view (the whole year, January to March…), and choose from three data analysis options: your daily values, weekly or monthly averages. 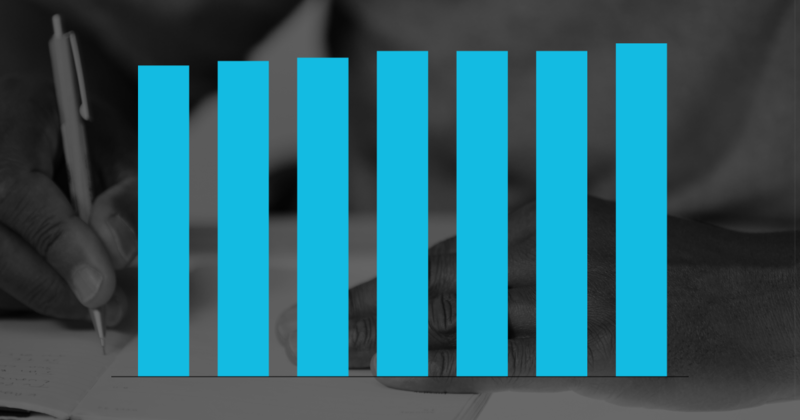 The result is a graph that visualizes how you’re doing – in all of its glory, or perhaps occasional astonishment. 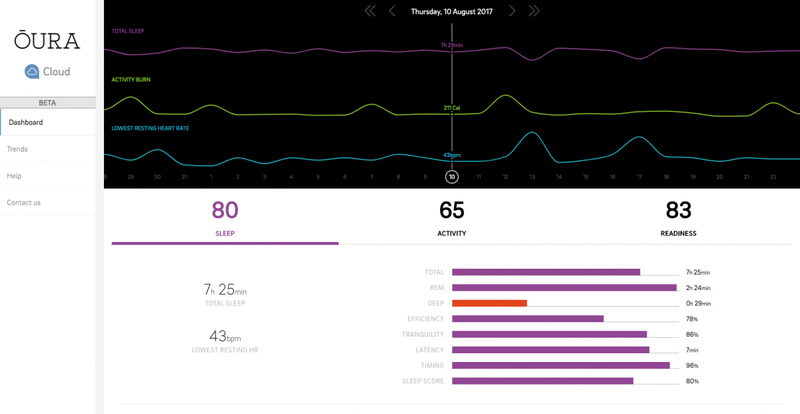 We at Oura are most excited about the weekly and monthly trends, because they reveal the big picture and show whether we are progressing or regressing with our sleep, recovery or activity. What Can You Learn From Trends? People have different types of rhythms, but when it comes to sleep, our bodies seem to appreciate routines. For example, the trends data has showed us that people who tend to be active in the evenings, but should follow the 8am to 4pm office routine, really seem to suffer from social jetlag on Mondays. 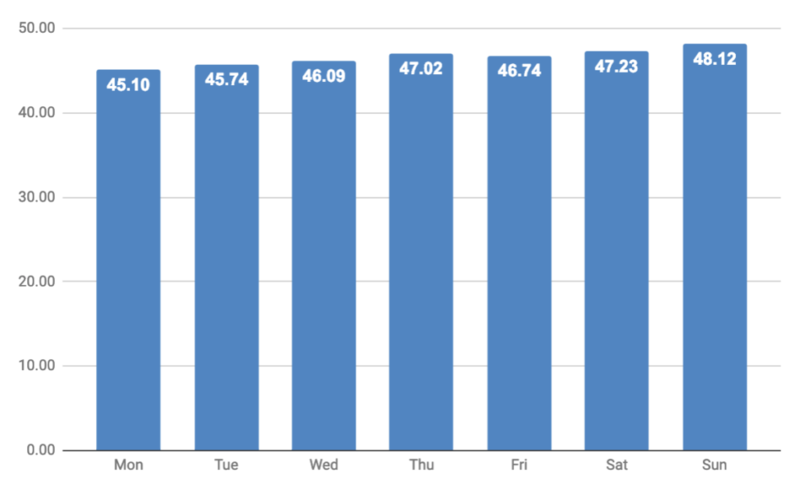 If your sleep schedule is significantly different on weekends, you might see a dip in the sleep quality curves. You can also track how different seasons influence your sleep quality and readiness. Here in the northern parts of Finland we’re interested in knowing how big of an effect the winter darkness and the midnight sun actually have on our sleep. You might want to track down the weeks in a month when you always seem to be the most ready for heavy training. As an example, for women, the best time to do the high(est) intensity workouts is the first half of the menstrual cycle. If you travel a lot, you could be interested in knowing how much it affects your long-term readiness. The Trends View guides you in getting the bigger picture of your wellbeing. But this is not the whole story with trends. In addition to learning interesting and important things from a single trend, you can extend your knowledge about yourself and your lifestyle by comparing different trends. 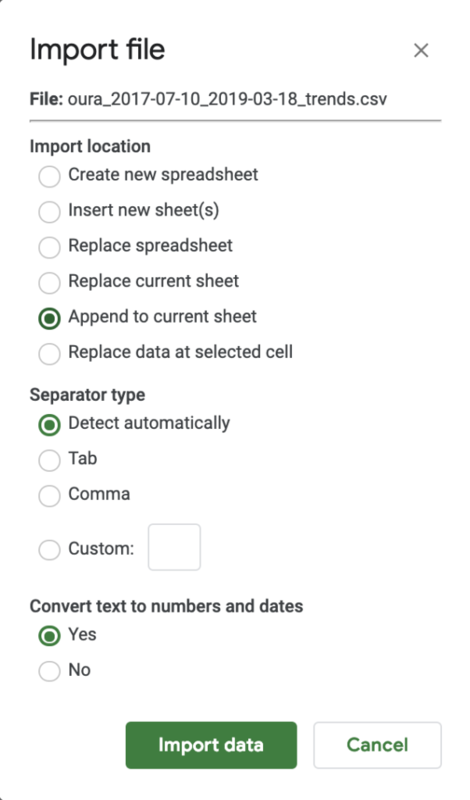 Just add a chart, select the metrics you want to track in the drop-down menus, and start digging deeper into the correlations between your readiness, sleep and activity. Are you ready to start exploring? Log in to your Oura Cloud and jump right in. And as said, we’re developing Oura Cloud further all the time, so we’ll keep you posted on new features. Sleep is an active state – even though you don’t remember most of what happens during the night. You go through different stages of sleep, some of which are as different from each other as they are from being awake. There are 5 stages of sleep that follow each other in a cyclical fashion: wake, relaxed wakefulness, light sleep, deep sleep and REM sleep. After reading this article, you’ll have a basic understanding of the sleep stages, what happens during them and how they affect you during the day. How Do Sleep Trackers Define Sleep Stages? Do you ever get the feeling that life is made up of two parts? On one hand, there are the hours you spend awake – being active, thinking, feeling, being you – and on the other the hours you spend asleep, your brain switched off and toes tucked away under the sheets. These three states of being are found in nearly all mammals and birds: wakefulness, Non-REM sleep and REM sleep. From a physiological viewpoint they are as different from each other as sleeping is from being wide awake. You just don’t notice it – mainly because you’re asleep. – Fly me to the Moon, Elvis. We know surprisingly little about sleep, despite the fact that it’s such a defining feature of our existence. For two thirds of the day we go about our business – live, love, eat, file the taxes – and then we put our phones on silent, turn off the lights and go into this weird mini-hibernation mode for 6–9 hours. For parts of the night, our body is paralyzed and our brain plays a remix of events and situations that were and could be (called dreams). When we wake up, we don’t remember much of what happened and we’re still learning about why. There are some things we do know. All mammals and birds sleep. Their sleep is divided into two states: REM (rapid eye movement) sleep and Non-REM sleep. This is the three-fold division of our existence: we’re awake, we’re sleeping and we’re dreaming. REM sleep is a stage in which the brain is active but the body is paralyzed. The name comes from the fact that during REM sleep our eyes dart about underneath our eyelids. It’s during REM sleep that we have our most vivid dreams. Non-REM sleep is a stage in which the brain is relatively inactive and our body is movable. Non-REM is further divided into stages based roughly on how deep the sleep is and how difficult it is to rouse someone from it. When you drift into sleep, you first go into the lighter stages of Non-REM sleep. Through these stages you move into REM sleep. This fairly predictable progression from Non-REM sleep to REM sleep is called a sleep cycle. In these 90–110-minute sleep cycles you sleep throughout the night. What feels like a complete blackout, or time-traveling, is in fact a fairly structured process that follows a predictable yet varied course. 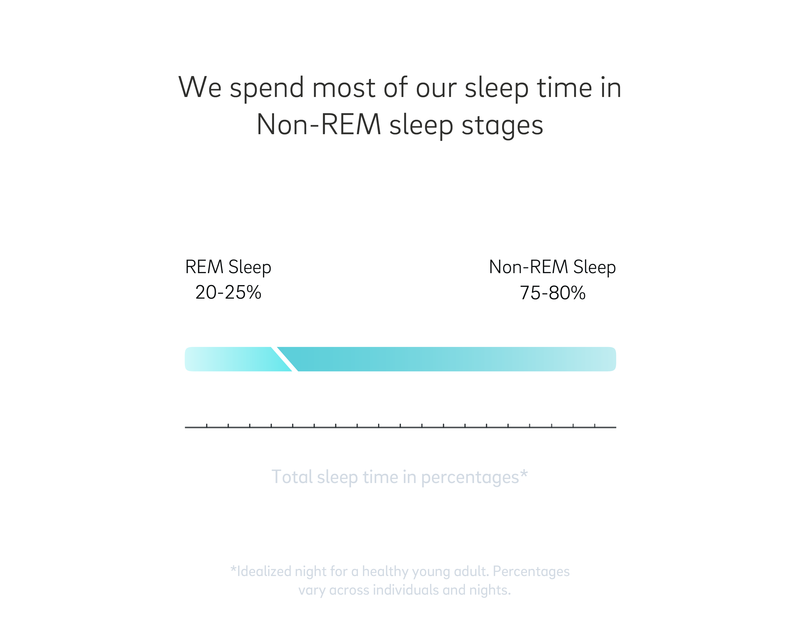 REM sleep accounts for approximately 20–25% of total sleep time, whereas NREM sleep stages account for the rest. If you sleep for 8 hours, the percentages translate to roughly 1.5 to 2 hours of REM sleep per night. The N in N1–N3 refers to Non-REM sleep. 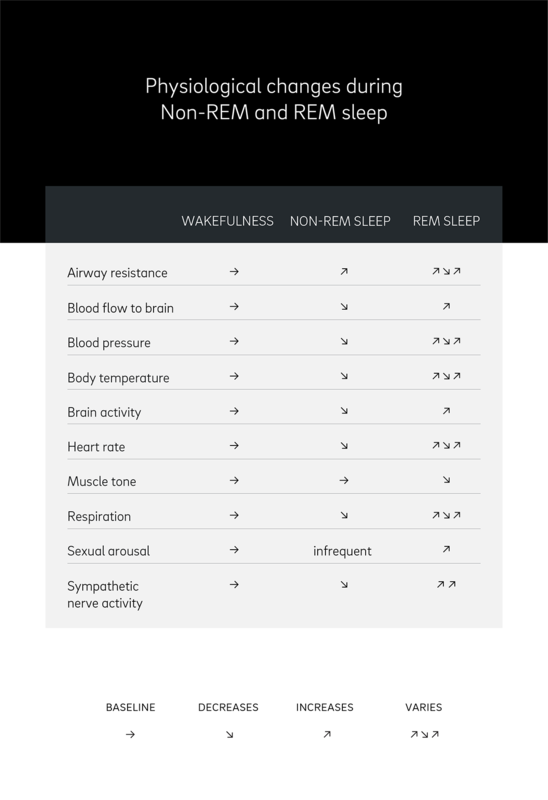 The AASM classification is the one used by Oura, except that we have combined N1 and N2 stages into one stage called Light Sleep. Each sleep stage is characterized by changes in our physiology. However, the transitions between stages may not always be clear cut, partly because traditionally sleep has been assessed in 30-second epochs. In the following sections we’ll go through each stage and take a look at what happens in your body during each stage, what you may experience and what are the functions of the different sleep stages. REM sleep is a sleep stage in which the brain is active but the body is paralyzed. Vivid dreams happen during REM sleep and your heart rate and respiration rate are increased. In terms of brain activity, REM sleep resembles wakefulness. You tend to get more REM sleep later in the night. REM sleep may be completely absent from the first sleep cycles of the night. REM sleep is linked to the circadian rhythm of our body temperature: our core body temperature starts to drop off when we fall asleep and reaches a nadir in the early morning hours. If you go to bed much later than usual, you may skip the first cycles of sleep (including regenerative deep sleep stages) and even go straight to REM sleep. According to studies on sleep deprivation, there seems to be a hierarchy when it comes to which sleep stages our bodies prioritize after loss of sleep: Deep sleep is recovered first, whereas REM sleep is recovered only after some nights of increased deep sleep. REM sleep accounts for 20–25% of sleep in healthy, young adults. However, there are individual differences as well as night-to-night variation. Stage N1 Sleep is a transition stage between wakefulness and the deeper stages of sleep. It is easy to wake up from this stage. During N1 you are aware of your surroundings but you become increasingly relaxed as you drift off to sleep. Illogical thoughts and sudden I-almost-fell-off-the-top-of-the-world twitches are normal during this stage of sleep. During the first sleep cycle, you usually spend less than 10 minutes in Stage N1 sleep. It accounts for approximately 5% of total sleep time. If you sleep for 8 hours, 5% is 24 minutes in total. Stage N2 sleep is stage of light, regenerating sleep. It is still relatively easy to wake up from this stage of sleep. As you fall asleep, the muscles in your upper airway relax and make your airways narrower. Have you ever wondered how you know someone has fallen asleep watching the TV? Even if you don’t see whether their eyes are open or not? It is often the sound of their breathing that gives them away. N2 stage sleep makes up the majority of our sleep: 45–50% in healthy young adults. With 8 hours of sleep, that is 3.5–4 hours of N2 stage sleep per night. 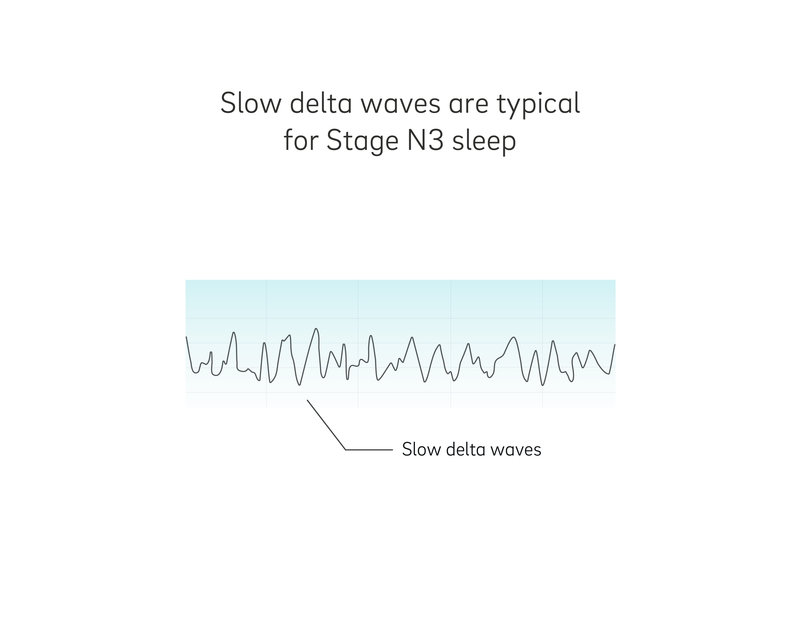 Stage N3 sleep, deep sleep or slow-wave sleep (SWS) is the most rejuvenating and restorative sleep stage. During deep sleep, the glymphatic system removes waste, such as neurotoxins and beta-amyloids, from the brain. It’s very difficult to wake up from deep sleep. If you’ve ever had to take an early morning flight and woken up groggy and disoriented, it may be because you were in deep sleep. There are several ways to get more deep sleep, from establishing good sleep hygiene to taking hot showers before bed. However, keep in mind that all stages of sleep are important for health and good-quality sleep, not only deep sleep. The amount of deep sleep declines with age. Older adults often report waking up more often during the night which is linked to the decline of deep sleep. As we’ve seen, sleep is not a uniform block of nothingness. During the night, different stages follow each other in fairly predictable patterns, called sleep cycles. A normal cycle starts from N1, goes through N2 to N3 and then back up towards REM sleep. The average length of a sleep cycle changes throughout the night. The first sleep cycle is usually shorter than following cycles, clocking in at 70–100 minutes. The average length of the sleep cycle later during the night is 90–110 minutes. If you sleep for 8 hours, you’ll usually go through five full cycles. Deep sleep predominates the first cycles of the night. 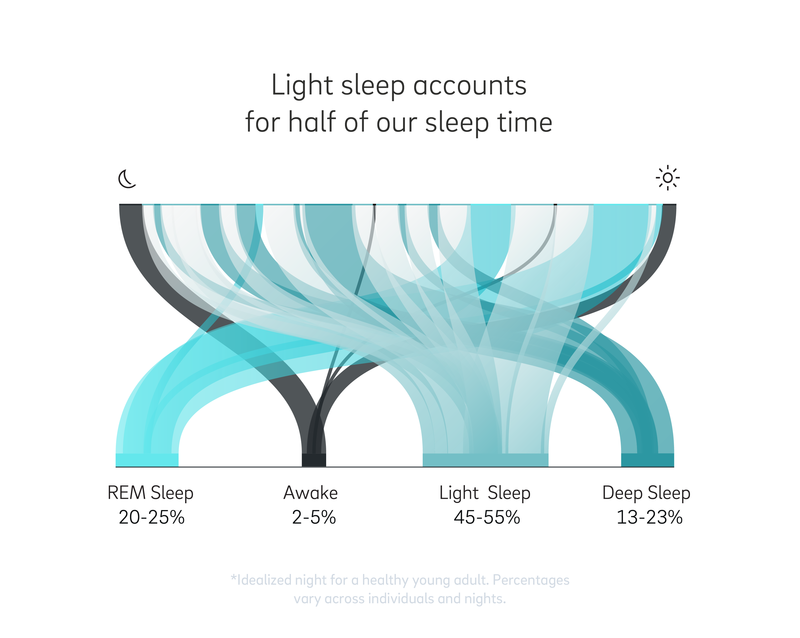 On the other hand, REM sleep predominates the sleep cycles of the last third of the night. 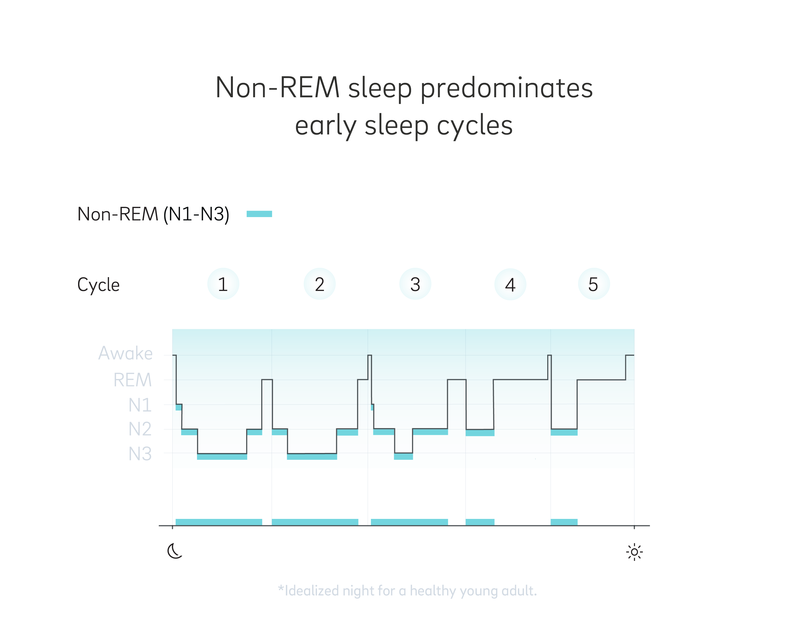 This is why one way to ensure you get enough deep sleep is to stick to a regular bedtime: if you go to bed later in the night, you may skip the first sleep cycles of the night and go straight to the REM-predominated cycles. There’s a phenomenon called the first-night effect that has been observed in sleep studies. In short, it means that whenever someone goes to a sleep lab, their first night’s sleep may be very different from a normal night’s sleep. It might be better, or might be worse, depending on the person. The main thing is that it’s different. That’s why it’s important to look at sleep over the long term, over several days, weeks and months even. Just like one bad night of sleep won’t ruin the next day, neither will one night of good sleep necessarily fix problems that have been going on for longer. By looking at multiple nights, you can start seeing how the stages of sleep affect each other. For example, deep sleep has been found to have a rebound effect: if you don’t get enough deep sleep one night, the amount of deep sleep the next night may be higher. The same goes for REM sleep. And it’s not only one night affecting the next night. There’s also the day in between – the choices that you make during that day – that has a profound effect. The night is the mirror of the day, and wake and sleep are deeply connected. 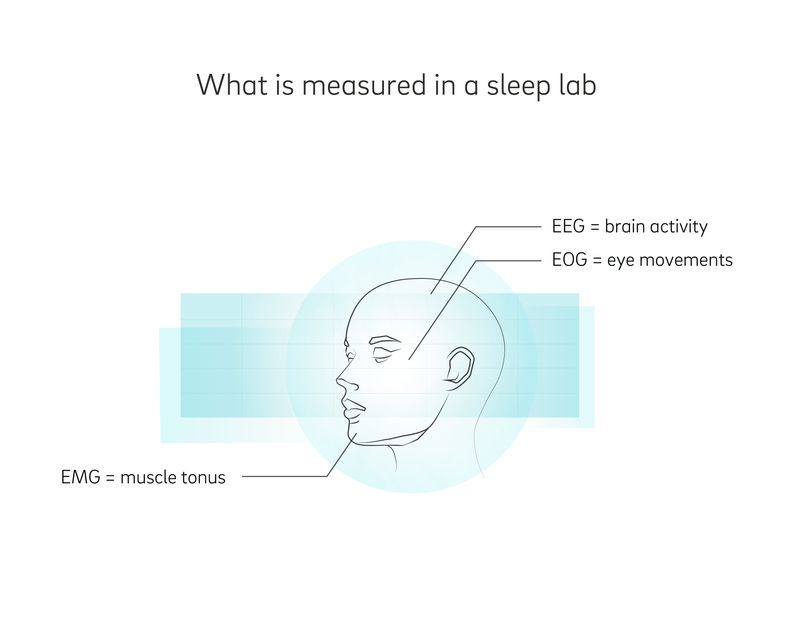 Traditionally, the stages of sleep have been measured and scored in a sleep lab, based on three polysomnographic measures and their variation as you move from one stage of sleep to the next. They are: muscle tone, eye movements and brain activity. The electromyogram (EMG) measures your muscle tone, how relaxed and pliable your muscles are. By placing electrodes under your chin, a sleep technician can measure your muscle tone throughout the night. During REM sleep, your body becomes paralyzed and you lose muscle tone. Rapid eye movements are one of the tell-tale signs of REM sleep. Electrodes placed near the eyes can track how much and in which direction your eyes are moving during the night. Brain waves or electric activity in the brain are measured with an EEG device, with electrodes placed on your scalp. Slow-wave sleep, or deep sleep, gets its name from the slow delta waves that predominate the EEG chart. 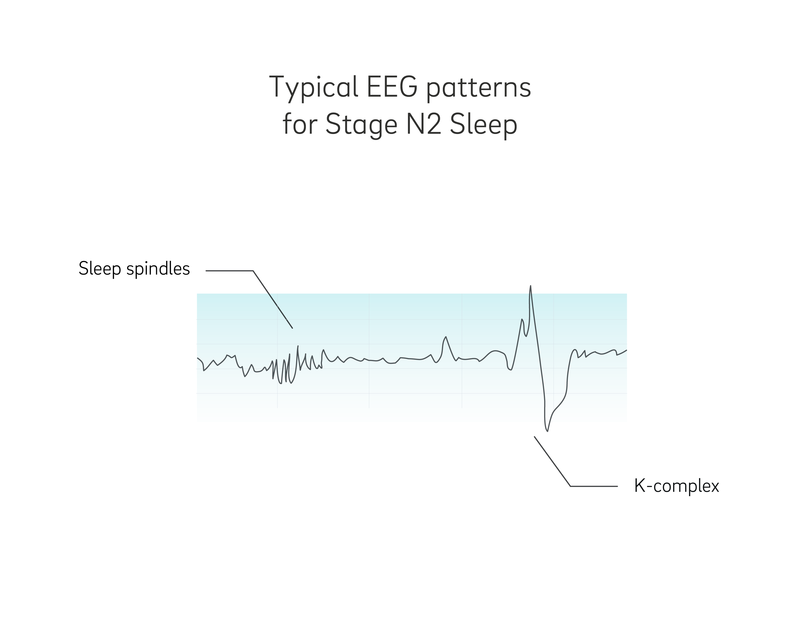 In the images you can also see the EEG patterns, such as sleep spindles and K-complexes that happen during N2 stage sleep. Commercially available sleep trackers use a variety of sensors to detect different stages of sleep. The more advanced sleep trackers available for use at home, like the Oura ring, track sleep and sleep stages based on data collected from the 3D accelerometer (movement), heart rate sensor (heart rate, pulse wave amplitude) and body temperature sensor. There are many factors that affect your sleep stage distribution, including age, previous nights, circadian rhythms, temperature, drugs and sleep disorders. Infants and kids have a very different sleep stage distribution from that of healthy young adults which is described in this article. Sleep is important in all stages of our life, especially in adolescence as we’re growing and our cognitive abilities are developing. As we age, it seems that there is more variability between individuals. Generally speaking, the older you are, the less deep sleep you tend to get. Especially older men get less deep sleep as they age. As we know, it’s harder to wake up from the deeper stages of sleep and as a result older people tend to wake up more often during the night. Their sleep becomes more fragmented and their sleep efficiency is lower. Older people also tend to take more naps during the day which affects their sleep during the night. Older people also tend to go to bed earlier and wake up earlier because their circadian rhythm is pushed forward. Staying active and getting sun light at the right times helps set the circadian clock. Sleep is a homeostatic process. How much sleep you need depends on how much good-quality sleep you have got recently. It also depends on brain metabolism. The more active your brains have been, the more sleep you need. If you’ve been sleep deprived, you’ll often see a rebound in the amount of deep sleep on the first night after sleep loss. In addition to the homeostatic sleep drive, also circadian rhythms affect your sleep. 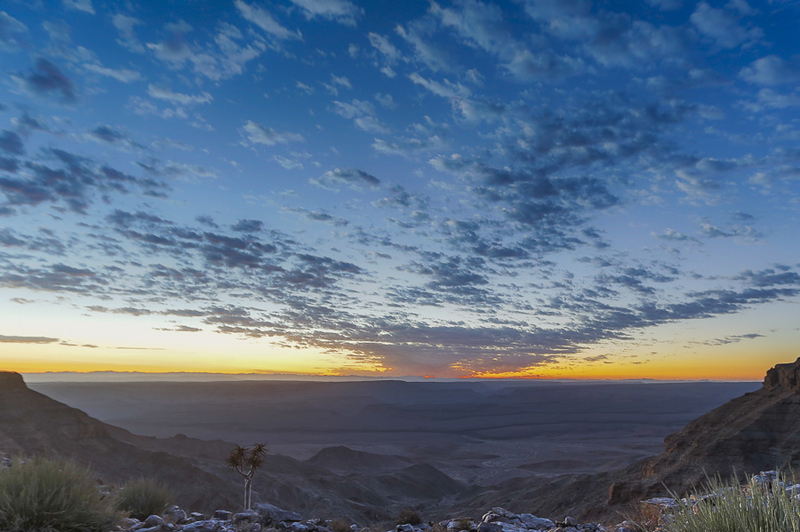 It’s easier to fall asleep at certain times of the day: in the early morning hours as well as in the afternoon. If you go to bed later than usual, in the early morning, you may jump straight to REM sleep. The temperature of the room you sleep in may affect your sleep stages. Extreme temperatures, both too cold and too hot, have a tendency to disrupt our sleep, especially REM sleep, because our body’s ability to thermoregulate is lower during REM sleep. Some drugs suppress REM sleep, while others suppress deep sleep. A glass of wine may help you fall asleep faster but tends to lower the quality of sleep. Sleep disorders, such as sleep apnea or narcolepsy, can have an effect on sleep stages. In sleep apnea, both the amount of REM and deep sleep may be suppressed. Do you feel rested and energized during the day? If you do, you don’t have to worry about sleep stages. Your body is doing its job and stressing over percentages or minutes spent in each stage is counterproductive. Following basic sleep hygiene takes you 90% of the way towards better sleep. Do you feel tired during the day? Do you usually fall asleep right as your cheek hits the pillow? Starting your journey towards better sleep and better health can start with tracking your sleep stages. If you see that you’re consistently not getting enough deep sleep, it could be a sign of something that should be checked by a sleep professional. And finally, do you feel rested, energized and curious? 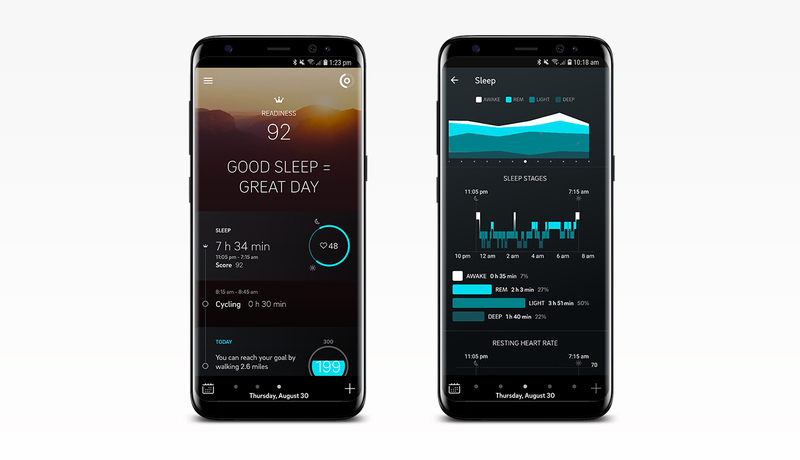 If you’re the type of person who likes to keep tabs on their physiology or see how their body reacts to daytime activities, consider getting a sleep tracker that tracks the stages of sleep. You might unlock the keys to better health and productivity by seeing what has previously been unseeable. iOS users can now import workouts from Apple’s Health app into the Oura app. Read more. Below you’ll find the updated shipment statuses and estimates based on order date. We’ve added percentages of orders shipped for Group A and B. The delays on titanium covers for some of the models and sizes are still affecting the ring shipments for Group A. Our factory is making rings nearly at maximum capacity and orders in Group A are our top priority. We’ll ship the remaining orders of Group A as soon as possible. Please note we’re making the rings in large batches, one ring model and size at a time. We then send out the rings to those who are first in line for that size and model. That is why some rings in Group B have been shipped already. The titanium covers for the unshipped rings have been ordered already, and we’ll be making the rings based on the current list of orders. If you want to change your ring model, it will result in a delay for your order. 34% of orders were shipped by October 5. 70% of rings estimated to be shipped by October 31. The majority of new orders after August 8 will be shipped out after the orders in Group C.
The latest shipment estimates are also available in our FAQ page. Share your experiences of the new Oura ring with #ouraring. The next Pre-Order Update will be published on the week of October 29. Until then, follow us on social @ouraring and keep an eye on the hashtag #ouraring. The Oura app for iOS now supports importing workouts from Apple's Health app. Track a training session with your favorite fitness tracker, sync it to the Health app and your workout will automatically appear in your Oura app, on your timeline and in the Activity View. This feature is only available with the Oura app for iOS. Update the Oura app. Allow workout imports from the pop-up window. 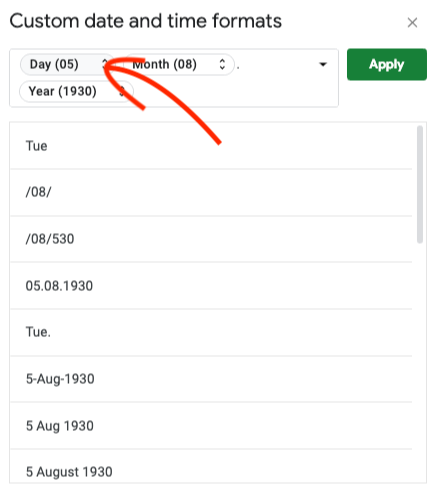 Workouts are imported for the current day only. They’re included in your activity and recovery calculations. 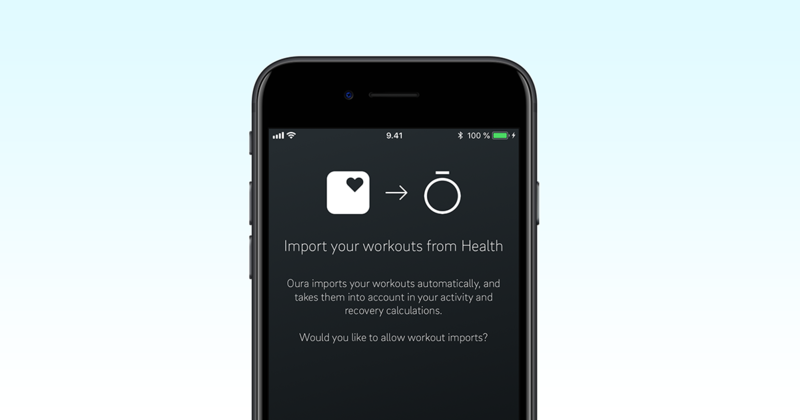 The ability to import workouts from Health has been a much-requested feature from our iOS users. It comes in especially handy for workouts when you can’t or don’t want to wear the ring. 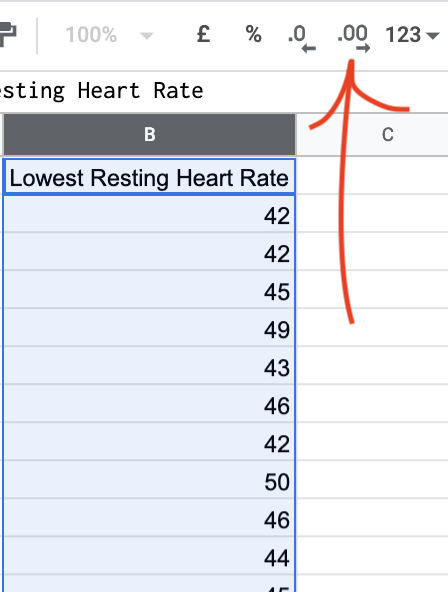 In addition to importing workouts, you can now export your night-time resting heart rate and average respiratory rate values to Health. Previously you’ve been able to export your bedtime and total sleep time, lowest nocturnal resting heart rate, active energy (activity burn), your height and weight. After you have connected the Oura app with Health, you can control what you import and export from within the Health app. Please note that some fitness and activity trackers count calories differently from Oura. The Oura ring and app calculate active calories, which only include the extra calories you burn during exercise, not your basal metabolic rate. Some fitness trackers calculate active calories + basal metabolic rate. For detailed instructions and other frequently asked questions, have a look at this Oura Support Page. The official Oura app for Android is out! 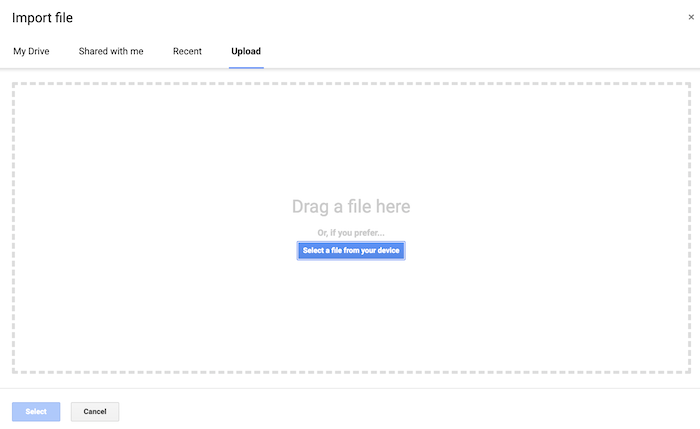 Android users can download the app from Google Play Store. Read more. The new Oura website is live. Have a look around on ouraring.com. We have now shipped over 10,000 rings! Below you’ll find the updated shipment statuses and estimates based on order date. You’ll also find what percentage of each ring model we have shipped. 76% of orders were shipped by September 14. 95% of the total orders in Group A will be shipped by September 30. There have been delays in getting titanium covers from our suppliers for some of the models and sizes, which is why some of the ring shipments in Group A have been delayed. More covers are coming in daily and we’re working hard to get the rings to you as soon as we can. 50% of all rings estimated to be shipped by September 30. All rings estimated to be shipped by October 31. First shipments sent by October 15. New orders after Group C according to original shipping estimate. Thanks again for sharing your experiences of the new Oura ring! The Oura Sleep Better Giveaway received more than 5,000 entries! We’ve chosen the winners randomly and contacted them via email. You can see the list of winners here. Thanks everyone for taking part! The next Pre-Order Update will be published on the week of October 8. Until then, follow us on social @ouraring and keep an eye on the hashtag #ouraring. Work. Life. Work life balance. Work life balance? The line above represents the tension that many motivated individuals who want to be successful in all their endeavors feel when it comes to setting goals and achieving them. 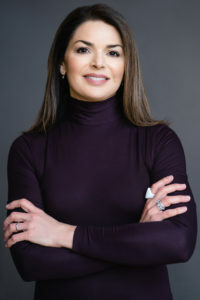 This month we check in with four driven, highly-effective individuals who are striving for success – all in their own unique way – and still manage to stay focused and grounded to live their best life. 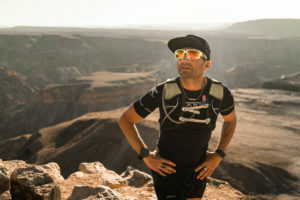 Whether they are building apps, keeping workers caffeinated or racing across the desert, these four unique individuals are blazing their own trail through the worlds of personal health, education and business. We’ll let them introduce themselves and a little bit about their recent endeavors. 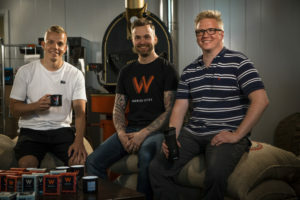 “I make peoples’ day better with coffee, running a company called Warrior Coffee. This article is more than just profiles in productivity. What drives these four is not just about having endless energy, burning the candle at both ends or amassing stories of endless work sessions. Many of you won’t be surprised to learn, it’s about a shared perspective in positivity and passion. Read on to learn how these four take on their challenges. 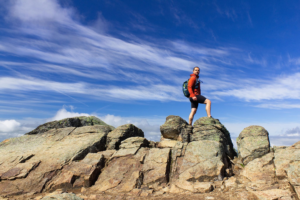 Do you believe you can be a founder and still live a balanced life? David: Absolutely. Balance is a skill, like anything else. And it needs to be trained like anything else. I have failed miserably here in the past, and I still fail more often than I’d like to admit. But, I am getting better at figuring out how toggle the “off” switch so that I can recharge and be fully “on” when it matters most. Riku: Absolutely. It’s a lot about one’s own attitude and mindset as the balance is often times a very personal thing. Sometimes one needs to go the extra mile, but I believe it should be a non-permanent thing in order to maintain long term balance. Catherine: Yes. Highly successful people I’ve come to know along the way have advised me to create the space to unwind, and I attempt to do this. Having a dog who needs walking helps! I find that although I am working a furious pace toward the launch of our product, I am also able to make decisions about taking a walk in Seattle’s Arboretum the middle of the workday, or to take a long weekend out of town. Ray: Yes. I believe we underestimate ourselves, and that our potential is only limited by how we define ourselves. How do you avoid overworking? Riku: During our first years, I admit working many times more than would be ideal. However, my goal was always to reach a healthy business operations and get couple more colleagues to share the workload and ideas with. Now we are about there and it feels great. There’s always something to do more so I’ve figured out the best way to avoid overworking is to basically disconnect and do all other things (like doing nothing). David: If I can stay one step removed and watch the coaching process somewhat objectively I can be aware of lapses in connection, attention, sensitivity, and quality. With this in mind I have to remind myself that those who I work with deserve my best, and to deliver anything less is unfair to them. This helps me avoid the romantic ideals associated with consistent overworking and reminds me that success in coaching is measured qualitatively, not quantitatively. To show up with my battery consistently half charged just isn’t fair to anyone. Do you balance the understanding of needing proper sleep with working in a startup? Catherine: I realize that proper sleep is key to my overall health, both now and in the future. Good sleep influences my ability to avoid colds and flu, enhances my cognitive abilities, influences weight management, stress hormone production, how healthy I appear, and contributes to the integrity of my very DNA. 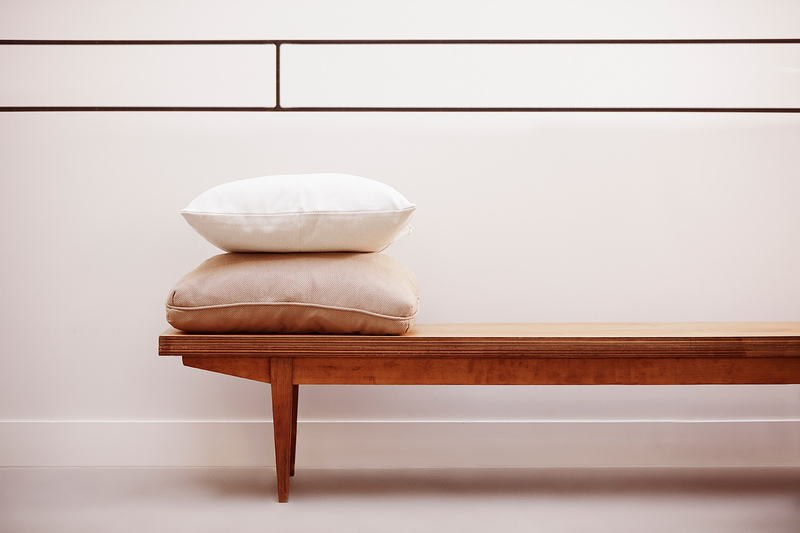 David: I think that taking some time to understand the restorative processes that occur during the sleep cycle has really helped me to make this a priority for both myself and my clients. We always say that there are some things that you can’t outwork (hormonal imbalances, nutrient deficiencies, sleep) no matter how determined you might be. We strongly believe that as coaches and as leaders in any realm of life it is up to us to lead by example and practice what we preach. So showing up exhausted and sleep deprived doesn’t cut it. This view has been doubly advantageous for our training center, as my coaches and I have to model quality sleeping practices in order to ask the same from our athletes. Riku: I get very motivated by the feedback and happiness we receive from our customers. That drives me forward and keeps us evolving. My team is also a huge motivation to me – we wouldn’t be here without them! Catherine: In nature. Beginning next month, I’ll be training for a ten-day backpacking trip in the Arctic National Wildlife Refuge. Although I love a good adventure trip, I find nature on my rooftop patio, where I have planted trees and converse with the hummingbirds that come to visit. David: First and foremost, from our members, both at The Distance Project and online through BRAVE Fitness. They inspire me endlessly through their commitment to fearless personal development. Ray: I am inspired by anyone who steps out and takes on a challenge – does something that feels uncomfortable and unpredictable at first, but pursues with passion. Whether in the arts, charity, sport, it doesn’t matter. What matters and inspires me are the people who go for it. How do you recharge, relax or reflect? Ray: I love having time with my family, hanging out. The hardest part of my job is when I am away from my family, so I truly feel a time of reflection is when I am at home or on the trails with my daughters, taking it all in. David: Getting into more advanced breath work and understanding how breath can be a tool to navigate your own physiology and manage arousal states has been really powerful for me. I use various breathing protocols throughout the day to slow things down so that I can tune in and reflect. Riku: I reflect almost daily and couple times a year I take more time for that. Usually the bigger reflection times are during summer and Christmas holidays. I tend to travel to change the environment completely as it takes some time to loosen up and see the famous big picture. Success. But Not Constant Perfection. Although these go-getters have each found their own levels of success, their stories are not all of constant perfection. Here, the four each share some of the challenges that they face. Catherine: I strive to make healthy choices, but I’m working at full-tilt, so struggle with things like sleep because of so much screen time. David: Balancing my own passion for coaching with some basic parameters around how many sessions or classes per day allows me to be most focused and affective. I remember going home after back- to-back-to-back coaching sessions and just passing out in my jeans. The ability to scale back from a scheduling perspective and incorporate some downtime into the day has allowed me to become a better coach. Ray: For our nonprofit i2P, we hope to grow our programs, with needed funding, to a point where we are able to conduct multiple i2P Youth Expeditions on a yearly basis. Riku: There have been quite interesting challenges with international trademarks as well as realizing that no matter how small or large is the demand, we need certain size of team all the time in place. It wasn’t a surprise that a common theme between these four was their passion for helping people, giving back and seeing their work through the lens of what they can do for others. David: I am now surrounded by clients who have become my greatest mentors, sources of inspiration, and some of my best friends. I am beyond grateful to share my knowledge with them as they share their knowledge and wisdom with me in return. It is a wonderful growth environment based on mutuality and respect. Riku: We want to keep on making peoples’ days better with our products. Warrior Coffee exists to make each day a little better, no matter how good or bad it turned out to be. We keep working with office & café customers strongly while finding all the time more room for our products internationally. That hopefully ensures us a healthy growth while bringing happiness to many people’s lives and also making Warrior Coffee a great place to work at. Ray: All of my expeditions are connected to classrooms and to a broader audience on social media. My goal is to essentially bring my expeditions into classrooms and living rooms around the world, and in turn, bring those classrooms and living rooms back onto my expeditions. Catherine: Consumers want to take charge of their health. Traditional healthcare costs are skyrocketing, and prescribed medications can have undesirable side effects when a more natural approach might be a better fit. Catherine: If I’m energized by what I am doing, I feel I’m on the right track. I set measurable goals and objectives and write them down. It’s interesting to look back and see how my ideas and goals have evolved. David: In both business and life I have one reference point for success and it is based on the following question: What is your mission? You can make a million dollars and be a “failure” and you can live on pennies and “succeed.” It all comes back to the core question of what you are actually trying to accomplish. I ask the question “What is my mission?” regularly. As I grow, learn, and evolve my thinking this answer matures. I gauge success by ability to accomplish things that are in-line with my mission. Ray: I measure success not by how much money I have or how many projects I have completed, but rather by how ‘happy’ or fulfilled I feel. We have one chance at life, and I spent the first 30 years of my life unsure, unhappy at times and directionless. Now, I have come to realize that true happiness is true wealth, and I remind myself constantly there is nothing else I’d rather do then what I am doing in life now. Riku: Professionally and personally I want to see some learning happening all the time. It doesn’t always mean financial figures growing. If we learn something new piece by piece it shows up in the bottom line too. Riku: I don’t know if these are really secrets, but I’d recommend ditching some social media apps from your phone and keeping your mobile phone outside bedroom at all times. There are regular, old school alarm clocks that work just fine. That’s a million-dollar question. I believe in finding something that you really love to do and then putting all your heart into that. The success will follow. Ray: I also spent a huge amount of (my first) 30 years ‘talking myself out’ of doing things for fear of what others would think, of the potential negative outcomes of taking a chance on something. Now, I talk myself ‘into’ taking chances. Assessing and then taking calculated risks, and going after my passion, not encumbered by how others may define me – but how I define myself. That’s what I truly believe is the first step in success. Taking a chance. Catherine: Be fearless about reaching out respectfully to people who you don’t know for guidance. I was advised to try this when I was in my 20’s and just getting started professionally – I’d call up people that I didn’t know and ask to meet for a few minutes around a specific question that I had. Conversations like this are what led me to begin a career in technology. David: To do work (either professionally, personally, or both) that makes you jump out of bed filled with passion and inspiration each day. And to eliminate any excuses as to why you can’t accomplish this. A few years ago I was on the verge on homelessness and living in a tent. I didn’t have twenty dollars to my name. I mention this because now, as I run two companies that I am proud of and have very high aspirations for, I am grateful for this vantage point which allows me to say with confidence that you can build your business from scratch. Catherine: If you aren’t present for your family and your health, no amount of business successes will matter in the end. David: Finally, the importance of gratitude as a consistent daily practice has been invaluable to me. Each morning I work to devote the very first thoughts of the day to gratitude, if only for a few seconds. Viewing the events of the day to come through the lens of gratitude has had a greater impact on my life and my business than I can possibly express. Riku: As the requirements towards individuals’ success grows all the time, it requires more work from us as individuals to choose what to in our lives, realistically. Not every day or week is going to be perfect and accepting that makes one’s life easier. Good things will follow. We are not meant to take care of all things appearing in our lives as we don’t get to choose all those things. Many times one might forget all the great things done while reaching towards the next goal. Ray: Go with your gut and sometimes you need to just jump all in. Our thanks to these brave Oura Community members for sharing their stories. Follow what Riku, Ray, Catherine and Dave are creating. Want to share your story with the Oura Community? Reach out and let us know. Are you looking for a way to help find balance in your life? The new Oura app is now available on the Google Play Store for phones running Android 6.0 and higher. You can use the redesigned Android app with the first and the new Oura ring. A big thanks goes out to everyone who used the Open Beta version of the Android app and gave us valuable feedback. 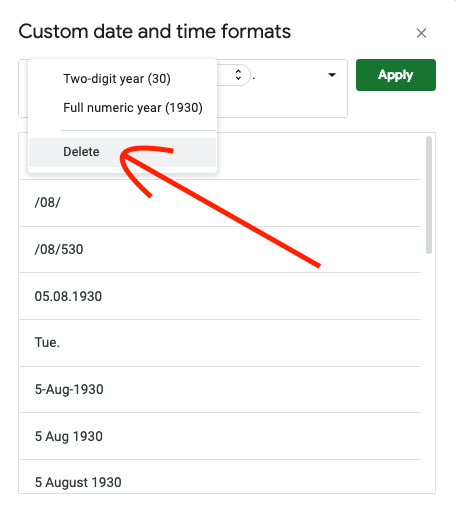 If you’ve been using the Open Beta version of the app, your app will automatically be updated to the official version 2.2.0. If you have the first Oura app (version 0.168.2) and don’t have automatic updates enabled, you can update your app manually in Google Play. Find the Oura app on the Google Play Store. Tap the button that says “Update”. Open the app, and continue using it from where you left off. None of your data will be lost when you start using the new Oura app. For more info and instructions, see the Oura Help pages. A new main view. 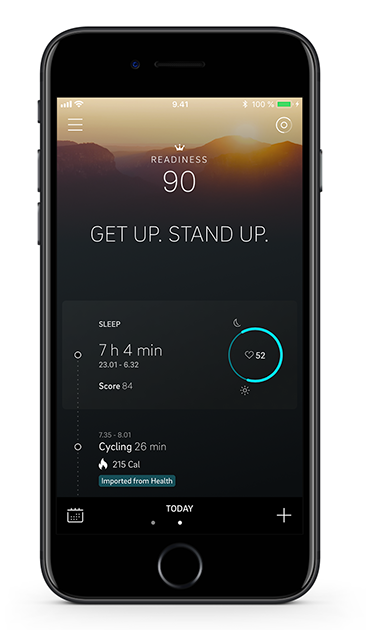 Quick access to sleep, readiness and activity insights and scores. Share them easily with friends. 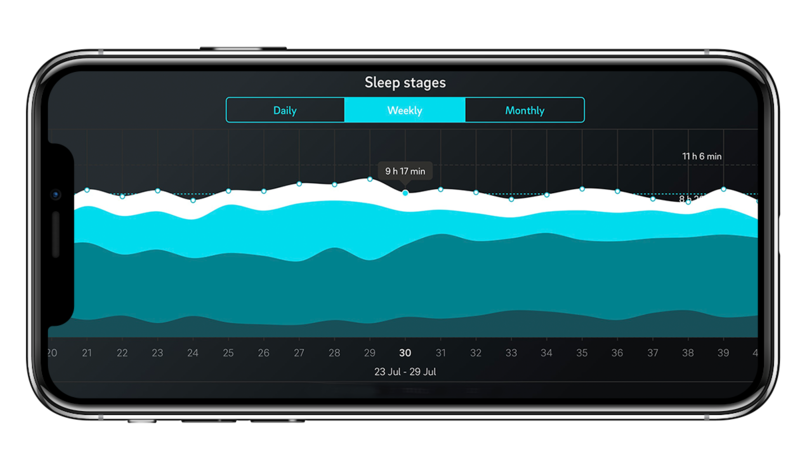 Informative trend views of your daily, weekly and monthly sleep, readiness and activity data. If you’re interested in learning more about the Oura app, read this article. Leave your email for a chance to win one of the prizes in the Sleep Better Giveaway. This giveaway is organized by Oura Health, Elektroniikkatie 10, 90590 Oulu, Finland. The giveaway runs from August 29, 2018 to Thursday, September 6, 2018, 11.45 PM PT (UTC-7). To enter, leave your email on the Giveaway Page (Update: This giveaway has closed). Limit of one entry per person. Oura Health will randomly select winners from all the eligible giveaway entries. The winners will be drawn on Wednesday, September 12, 2018 after the giveaway has ended. Only the giveaway winners will be contacted personally. The prize will be shipped to the winner. Oura Health will pay for shipping. The recipient will be responsible for all taxes or other fees associated with receiving the prize. The part before the @-sign of the winners’ email address will be published on this page. Full email addresses will not be published. The giveaway is open globally to people 18 or over. There is no entry fee. The giveaway is void where prohibited by law or where the registration or filing requirements of any country, state or local jurisdiction have not been complied with. Oura Health employees, affiliates and their immediate family members are not eligible for this giveaway. This giveaway is no way sponsored, endorsed or administered by or associated with Facebook, Twitter or Google+. Oura Health doesn’t accept responsibility for any expenses, damage or injury that may befall the winner when enjoying the prize. Oura Health reserves the right to disqualify entries for any reason, including entries that don’t follow the guidelines or violate common decency. 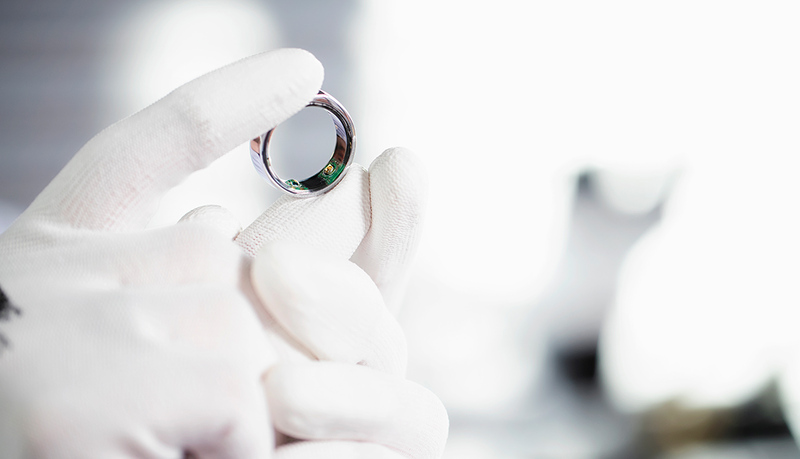 Approximately 70% of the users in Pre-Order Group A have had their rings shipped. We’re shipping out the remaining rings in Group A in the next two weeks. We are shipping hundreds of rings every day and you will each get your ring soon! Since many of you have asked for more information on certain models and colors, this Pre-Order Update goes into more detail on those. We sincerely apologize for the delay and we understand your frustration. As a result, we’ve also decided to create a free product giveaway for all of you for being a valued Oura customer! Please read below for details on how to enter. Below are the shipment statuses and estimates based on order date. More than 70% of orders shipped by August 31. We have had some delays on Rose components from our suppliers, but those models should be shipped by September 30. Certain components for Heritage rings arrived earlier than Balance rings. As a result more of Heritage rings have been shipped than Balance rings. 70% of Silver, Black and Stealth rings estimated to be shipped by September 30. All Silver, Black and Stealth rings estimated to be shipped by October 15. Majority of Rose rings estimated to be shipped by October 15. All Balance Diamond rings estimated to be shipped by September 30. First shipments sent by September 30. All shipments sent by October 31. New orders after Group C according to original shipping estimate of 8–12 weeks. UPDATE: The official Oura app for Android is now available in the Google Play Store for phones running Android 6.0 or higher. To install, search for Oura or go to this page on your phone. More info here. The Open Beta for the Oura app for Android is now available for phones running Android version 6.0 and higher. To join the Open Beta, follow these instructions. Our mission is to help all of you sleep better. The start has been a bit rough, because many of you are still waiting for your rings. However, to celebrate nearly half of pre-orders fulfilled we’re having a Sleep Better Giveway that you can join if you want. It may not be as good as that “Your Order Has Been Completed” email but it’s one way of saying that we’re here for you. You can participate in the giveaway here. The giveaway ends on Thursday, September 6, 2018, 11.45 PM PT. Read the official rules here. Last time we asked you for your unboxing experiences. We’ve seen some fantastic ones over on Facebook and Instagram. Thanks everyone for sharing! We know that many of you have been, in your own words, “stalking the hashtag #ouraring” and it’s great to see many of you receiving the rings and sharing the positive first impressions. Truly appreciated. Many of you have been reaching out to our team for help and information. To make sure you get an answer as quickly as possible we have added new members to the Oura Support Team and we’re currently hiring more new people to join the team. The next Pre-Order Update will be published on the week of September 17. Until then, follow us on social @ouraring and keep an eye on the hashtag #ouraring.